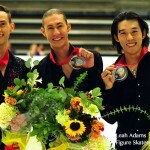 2015 U.S. Champion Jason Brown won the gold medal at the U.S. International Classic in Salt Lake City, Utah, Sept. 15-16. Reigning U.S. Champion took home the bronze medal, behind Japan’s Takahito Mura. To see pictures from the men’s event, click here.